Understanding geological and hydrogeological characteristics in coastal areas is an issue of paramount importance considering its socio-economic relevance, whereas, to date, limited information has been acquired due to the lack of suitable survey methods. We have conducted an airborne electromagnetic survey in an alluvial coastal plain, Kujukuri, in southeast Japan, to examine the effectiveness of elucidating the subsurface electric-resistivity structure both on land and offshore. Our approach was to use a grounded electrical dipole source and a helicopter-towed magnetic field receiver. Repeated surveys both at high and low tides revealed that a reliable resistivity structure is available to a depth of 300–350 m in coastal areas where shallow (∼5 m deep) water prevails. Coastal areas are vital for human activity, because many people live and work in them. Nevertheless, coastal areas are vulnerable to natural disasters such as earthquakes, tsunamis, and hurricanes (e.g., Mallin and Corbett, 2006; Wang et al., 2006; Hornbach et al., 2010), as evidenced by the recent magnitude 9.0 Tohoku earthquake that devastated coastal areas in northeast Japan on March 11, 2011. In order to mitigate natural disasters, it is important to map and understand underground features in coastal areas, because liquefaction caused by earthquakes depends on geological settings (Hallier et al., 2008), tsunami generation is, to some extent, associated with underwater landslides caused by the instability of sediments (Tinti et al., 2006), and hurricanes are major factors which erode, transport and redeposit sediments in coastal areas (Miner et al., 2009). Underground electrical resistivity is an important geophysical property because it responds to both groundwater salinity and geology. In general, low electrical resistivity corresponds to high salinity and/or soft sediments. To determine the electric-resistivity structure in coastal areas, airborne electromagnetic (AEM) surveys have been used (e.g., Vrbancich and Fullagar, 2007; Viezzoli et al., 2010). Vrbancich and Fullagar (2007) showed AEM can reveal seawater depth, sediment thickness, and depth to bedrock. However, until now, AEM could only reveal the resistivity structure to a depth of ∼200 m in coastal areas (Viezzoli et al., 2010). Conventional AEM, using an airborne inductive source limits the depth of exploration because the presence of a conductor, such as saline surface water, decreases the penetration of the AEM signal. In order to enhance the depth of exploration, we used a grounded electrical source aligned parallel to the coast line and towed a magnetic receiver in the air. The method, called grounded-electrical-source airborne transient electromagnetics, or GREATEM (Mogi et al., 1998), should enhance survey depth in coastal areas, since this method galvanically injects electric current into the ground. The method has increased the depth of exploration to 800 m in on-shore areas (Mogi et al., 2009) compared to 300 m by conventional AEM. The Kujukuri coastal plain, Boso Peninsula, southeast Japan (Fig. 1) was selected for our study. It is one of the longest coastal plains in Japan measuring 60 km in length and 10 km in width. 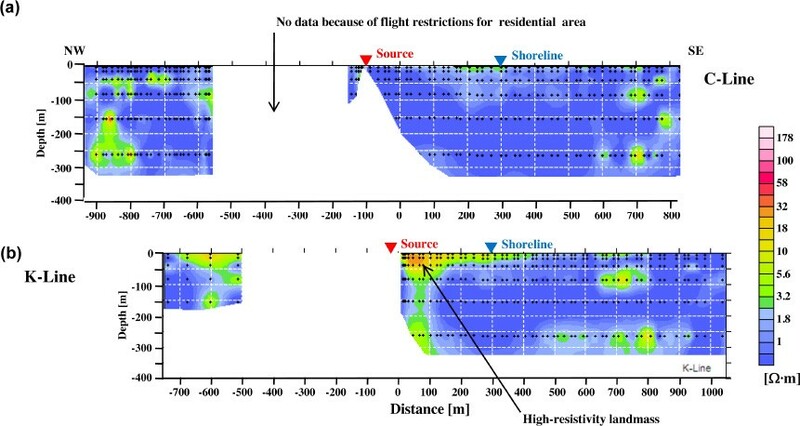 This area is suitable for our first attempt because the seawater is shallow and adequate resistivity data from previous investigations were available (Mitsuhata et al., 2006; Uehara et al., 2007; Hayashi et al., 2009). Mitsuhata et al. (2006) applied three types of grounded-source resistivity surveys: audio-frequency magnetotelluric, transient electromagnetic, and small loop-loop EM measurements. They revealed resistivity features to a depth of ∼500 m on the landward side and the existence of deep fossil saline water underneath. Uehara et al. 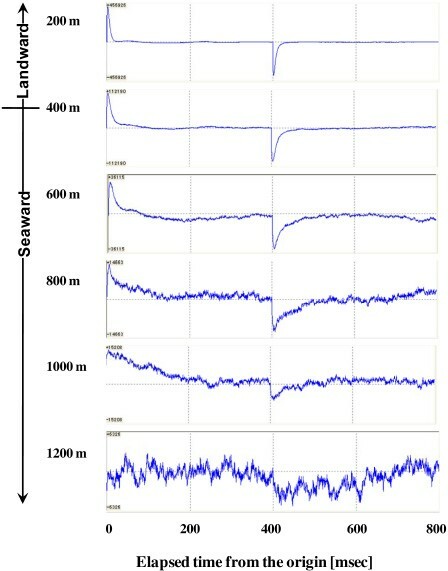 (2007) applied electric resistivity measurements along a land-seafloor crossing line and determined the resistivity structure to a depth of 40 m both on the land and sea sides. (a) Location of survey area in the Kujukuri coastal plain with 5-m bathymetric contours. White dots denote the places where current dipole electrodes were placed. (b) Survey area and flight lines. The thick black line indicates the transmitter cable, which was placed 300–400 m inland and parallel with the coastal line. Meaningful data were obtained along flight lines with a thicker color. A black dot indicates the wellbore site in Hayashi et al. (2009). A grounded electrical dipole source of 2.I km long was set ∼300 m inland parallel with the shoreline (Fig. 1). Flight reconnaissance was conducted on September 7, 2010, when the difference in tide height was the largest (1.1 m). Flights along eleven lines (A-K lines) spaced 200 m apart were performed twice (at the time of low and high tides) to examine whether a difference in tide heights affects the results. Due to flight regulations in Japan, residential areas were avoided. The source signal was a time-varying current injected into the ground by the grounded electrical dipole. Three components of the secondary magnetic field were recorded in the air. The magnetic field responses were recorded for both the current ‘off’ as well as the current ‘on’ time, and only data for the current ‘off’ time were used because they were found to be better in quality than those for the current ‘on’ time. The waveforms were digitized using a 24-bit AD converter at a sampling rate of 80 µs, and 20,000 data points were recorded during one transmitter cycle (1.6 s) for this survey. These data acquisition instruments and batteries were placed in a ‘bird’ towed by a helicopter. The height of the bird was maintained at 100 m, which means safe reconnaissance is possible compared with a much lower bird’s height (∼30 m) for conventional AEM. The GREATEM system used was the same as reported by Okazaki et al. (2011), in which the data reduction method, including noise elimination, was described. After the corrections for motion-induced noise, and natural and artificial noises, the data of 5 cycles (8 s, including two waveforms in each cycle) were stacked to minimize random noise, which averages ∼110 m along the flight path for the flight speed of 50 km/h used in this study. Finally, the transient response was inverted to a resistivity structure, assuming a horizontally-layered structure. The inversion was made by comparing field data with theoretical responses. Eight horizontal layers were assumed and a non-linear least-squares method (Sasaki, 1981) was applied to obtain the resistivity structure. As shown in Fig. 2, the waveforms, after noise reduction and stacking, are clear on the land side (200 m from the source) and get gradually noisier going offshore, and become undetectable at 800 m offshore (1200 m from the source) in this case. Waveforms of the vertical component of secondary magnetic fields after 10-time stacking at flight line F. Distances from the electrical source are shown to the left. The shoreline is ∼400 m from the source. The resistivity structure (Fig. 3) shows that a low resistivity of less than 1 Ω m prevails beneath both land and sea. Landmass with higher resistivity (∼3−10 Ω m), herein called high-resistivity landmass, exists to a depth of ∼50 m between the shore and ∼300 m landward from the sea. These features are the same both at low and high tides, indicating both the reliability of the results and the inability to discriminate tidal effects by this method. It is notewor-thy that some flight lines have thicker high-resistivity land-mass than others as shown in Fig. 4(b). The thickest high-resistivity landmass resides in the K-Line, which lies almost along a river (Fig. 1), therefore this landmass corresponds to either thick sand deposits, or less saline groundwater mass, or both. Resistivity profiles along flight line F at low (a) and high (b) tides. Using electric resistivity measurements, Uehara et al. (2007) showed that a high-resistivity landmass of 3–100 Ω m exists to a depth of 30 m beneath the beach, and a low resistivity (less than 2 Ω m) prevails below the bottom of the high-resistivity landmass and adjacent sea bottom. This corresponds well with our results (Figs. 3 and 4), although the resolution of GREATEM is much lower than the electric resistivity method. Resistivity profiles along flight lines C (a) and K (b) at low tide. Mitsuhata et al. (2006) applied three different-scale electromagnetic measurements on land. 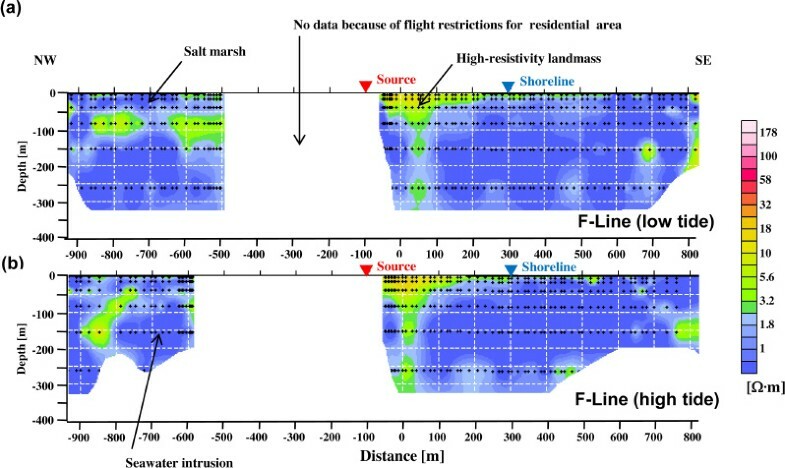 Their results show that on the land side a high-resistivity surficial zone about 30-m thick (sandy ridge) is underlain by a low-resistivity (∼1 Ω m) zone, which was thought to be caused by sea-water intrusion. They also showed that a surficial low-resistivity structure (salt marsh) exists behind the sandy ridge. These features are also recognized in our study (typically shown in Fig. 3), assuring the credibility of our method. Hayashi et al. (2009) reported wellbore logging data from 30 m to 1660 m in depth adjacent to our study site (Fig. 1), which shows that a low-resistivity zone of 1–2 Ω m comprised of Quaternary siltstone exists from 30 m to at least 1000 m in depth. This also is in good agreement with our data. The reason the electrical source was set 300–400 m inland was to gain the highest quality data beneath the shoreline. This goal was achieved as evidenced by a clear signal at the shoreline (see Fig. 2). Although the method employed has some limitations in that it is impossible to delineate the resistivity structure directly beneath the source (typically shown in Fig. 4(a)) and data quality becomes worse with increasing distance from the source, the GREATEM system has the capability to determine the underground resistivity structure to a greater depth and more safely than conventional AEM. It was found that GREATEM can determine the resistivity structure in coastal areas to a depth of 300–350 m up to ∼800 m offshore. These values depend on the configuration of the system (e.g., the length of the dipole electric source and its power, etc.) and noise reduction techniques, which will be improved in the near future. The method is useful to map the three-dimensional distribution of sand ridges and underground saline water. This information is vital for the mitigation of natural disasters such as earthquakes and tsunamis, the management of water resources, and development planning in coastal areas. Staffs at Northern Chiba Prefecture Forestry Administrative Office, Chiba Prefecture Sammu Improvement Center, Chibaken Recreation Toshi Kaihatsu Co., and Sammu City Office were helpful to conduct the field experiment. Staffs at Nakanihon Air Service Co. performed the flight reconnaissance. Dr. D. Fitterman and an anonymous reviewer were helpful to improve the manuscript. We sincerely thank all of them.